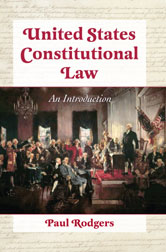 This book provides a basic understanding of Constitutional law, addressing both the history of the U.S. Constitution and each of its individual clauses. It explains the power of the Supreme Court, whereby a bare majority of five justices, each with lifetime tenure, can overrule the president, the Congress, and state and local governments--effectively declaring the rights and obligations of persons and organizations across the land. Referencing more than 950 Supreme Court decisions, the book treats each subject objectively and without opinionated commentary.